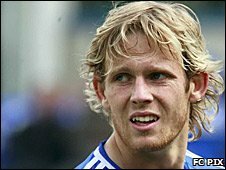 Peterborough United striker Craig Mackail-Smith has confirmed he would be interested in discussing a move to Norwich City. Posh have rebuffed interest from the Canaries, but director of football Barry Fry has conceded they face a fight to hold onto their top scorer. Mackail-Smith told BBC Radio Cambridgeshire:"It's obviously a great compliment if they're interested in me. "I've always said that if the club accept a bid, then we'll talk." Mackail-Smith scored in Tuesday night's 4-1 win at Sheffield Wednesday, despite renewed speculation over his future. Norwich are yet to return with an improved offer for the 27-year-old who has now scored 27 goals this season. "We've got until Thursday's loan deadline to see if anything will happen, but I'll just be concentrating on doing my best for Peterborough," Mackail-Smith said. "If an offer comes in then I'll sit down and see what I need to do, but I really appreciate the support I get from Posh fans." Fry has revealed that he believes the former Dagenham man will quit the club over the summer. He has 18 months remaining on his current deal, but manager Darren Ferguson says fans have no need to panic just yet. "Football's a funny game and if we get back in the Championship then you never know, but it will be difficult," he said. "Never say never in this game. Craig is highly rated and nowhere more so than here."